Listing courtesy of Gateway Estates LLC. Listing courtesy of AMG Realty Inc. Courtesy of PEMCO Realty, Inc. Listing courtesy of PEMCO Realty, Inc.. Listing courtesy of Laulima Real Estate Group, LLC. Listing courtesy of Century 21 Island Homes. Listing courtesy of Central Pacific Realty Inc. Courtesy of Sachi HI Pacific Century Prop. For those looking to enjoy the natural beauty of Hawaii, in a well developed community with everything from a Costco to the Original Roy's Restaurant, you need to look no farther than Hawaii Kai. With a number of different neighborhoods and developments, Hawaii Kai is a haven for those who wish to escape the Honolulu-Metro atmosphere, without being to far away from the downtown area. Just a 15-20 minute commute into Honolulu, Hawaii Kai is perfect for everyone from growing families, to business professionals, or those who work from home. Real Estate in Hawaii Kai ranges from entry-level condominiums, to gated communities, and is available to a wide range of buyers. 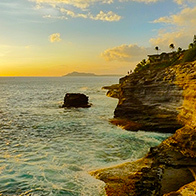 Perhaps the most recognizable neighborhood is the beautiful Portlock community, where many of the luxury homes feature panoramic views of the ocean, mountains, and Diamond Head. For those who work downtown on the weekdays, there is much to enjoy in Hawaii Kai on the weekends. Hikes up Mariner's Ridge, or Koko Head are both challenging and rewarding. There is of course an abundance of ocean activities, from surfing to boating, kayaking, and kite-boarding. Haunama Bay and Makapu'u are of course just minutes away, and Koko Marina Shopping center is there for all your shopping, and dining needs. Want to find out more about buying or selling real estate in Hawaii Kai? Contact our Hawaii Kai Specialist or call 808.971.7711 for more information. © 2014 - All Rights Reserved by Hawaii 5-0 Properties, Inc.